There’s no better occasion than a new year to make a change for the better — especially when it comes to your diet. Making better choices doesn’t have to mean bland food and restrictive rules, though, and it certainly doesn’t mean you need to stop eating out. As one of their New Year’s resolutions, Milestones is helping diners balance taking care of themselves and treating themselves. 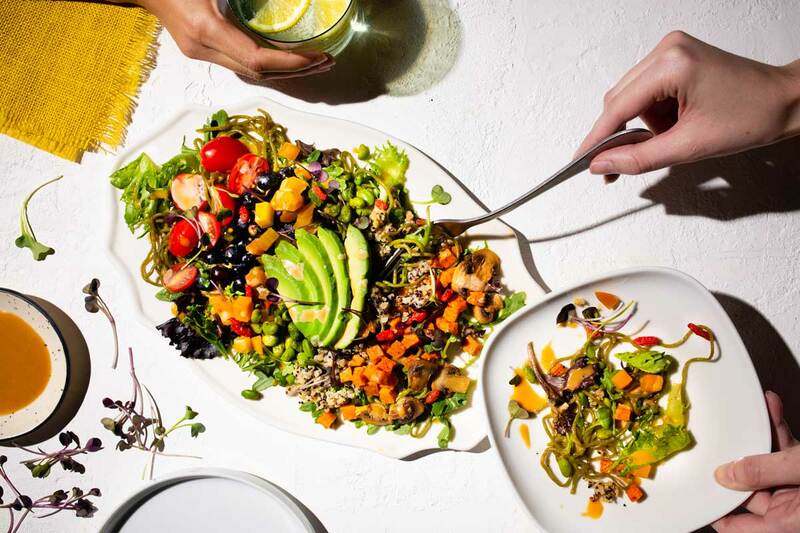 The restaurant’s new limited-time Superfoods Menu features dishes that are not only delicious, but also packed with nutritional benefits like probiotics, antioxidants and omega-3 fatty acids. Only available until February 24, these dishes are a great way to usher in a new year. Here’s what you can look forward to on this limited-time menu. This is the ultimate feel-good salad, reaching new proportions of nutrition-packed deliciousness. Kale-infused soba noodles and nutty quinoa make the dish filling enough to work as either a shared appetizer or a full meal, but the medley of arugula and grape tomatoes keeps things light. Blueberries, golden beets, roasted mushrooms, goji berries and edamame transform this into an anything-but-ordinary salad while delivering maximum nutritional benefits. Lightly drizzled with a maple-miso dressing — with an option to add on a protein — makes this offering one that shouldn’t be missed. A great choice for the seafood lover, this appetizer is a riff on traditional crab cakes, using an elevated combination of salmon, shrimp and quinoa. 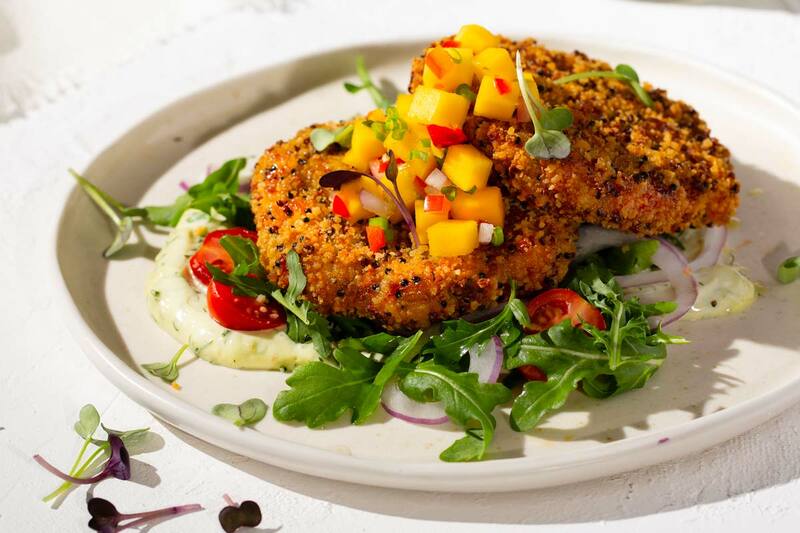 Crispy on the outside and tender on the inside, the cakes are served with a mango salsa, wild baby arugula greens and an avocado dill aioli. Far from a guilty pleasure, this dish is virtuously packed with vitamins, protein, omega-3s and probiotics, which promote a healthy digestive system. Go ahead: order an appetizer you’ll actually feel good about. If, like us, you can’t get enough of tuna poké, then this power bowl is for you. 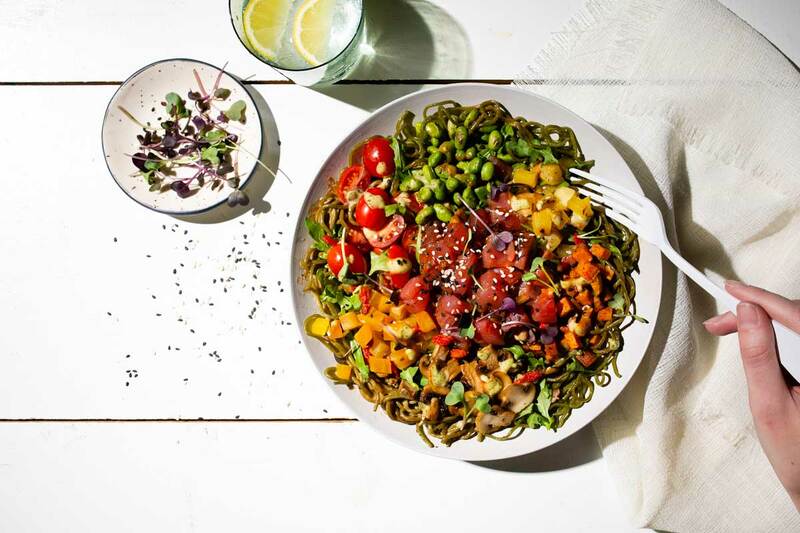 Ahi Tuna meets its match with kale-infused soba noodles tossed with peanut sauce and blistered edamame. Satisfy all your cravings with a mix of grape tomatoes, grilled pineapple, mushrooms, sweet potato and golden beets, balanced with a bright dressing of wasabi ponzu sauce. Not only filling and delicious, this bowl delivers a punch with the added nutritional benefit of protein and omega-3s. An elevated way to get your omega-3s and other good-for-you fats, the Pan-Seared Rainbow Trout is packed with savoury superfoods. 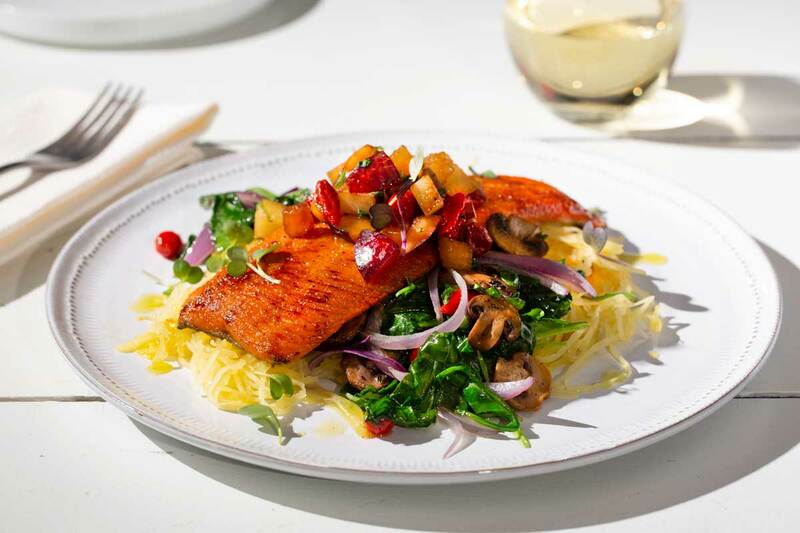 Set atop a bed of spaghetti squash, wilted arugula, kale and spinach, the tender seared trout is complemented by a charred plum and goji berry salsa and basil-infused oil. Crafted with a suite of healthy ingredients, this main dish is a delectable way to start out this new year with an antioxidant-rich diet — not to mention getting in other beneficial components like fibre, protein, calcium and probiotics. If you’re not a fan of seafood, there are still plenty of great options on the menu. Take this Fiery Tunisian Chicken dish, for example: tender grilled chicken gets dressed up with a spicy harissa sauce, made up of a blend of hot chili peppers and roasted red peppers. 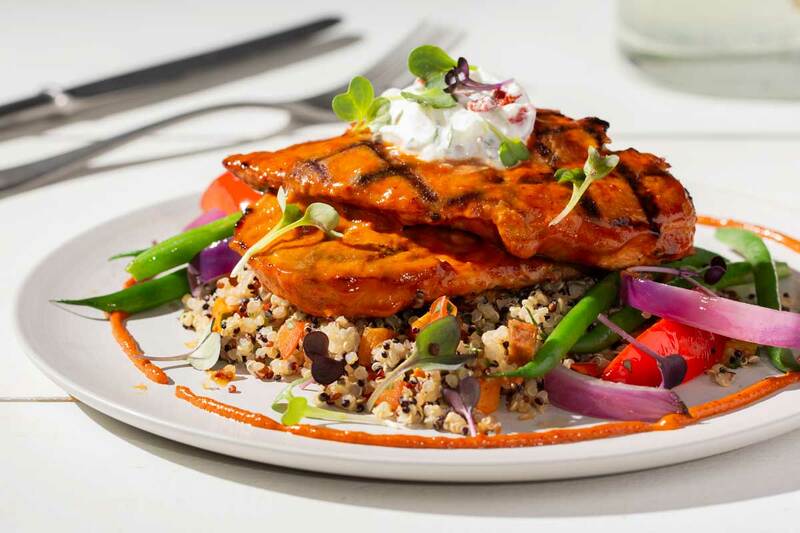 Goji berry and cucumber-infused Greek yogurt tones down the heat, while the roasted sweet potato and quinoa pilaf and seasonal vegetables lend a light, balanced element. The feel-good superfoods options don’t stop at main courses. Yes, it is possible to make dessert choices that won’t leave you feeling overfull — or overly indulgent. 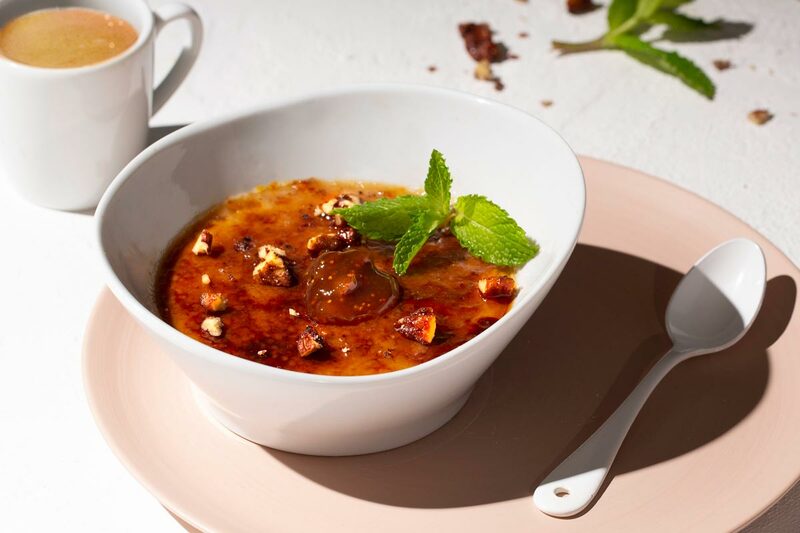 The richness of crème brûlée is matched by the complex notes of espresso, chestnut and spiced pecans in this knockout dish. Topped with fig jam and a sprig of mint, this is the kind of treat we’re all for. It’s a pleasant indulgence you won’t feel bad about — and a happy ending to a satisfying and nutritious meal.